This book was written to be used as the primary text for a transitions course (introduction to proof), as well as an introduction to topics in discrete mathematics. Topics: Counting; Sequences; Symbolic Logic and Proofs; Graph Theory; Generating Functions; Introduction to Number Theory. Applied Finite Mathematics covers topics including linear equations, matrices, linear programming (geometrical approach and simplex method), the mathematics of finance, sets and counting, probability, Markov chains, and game theory. This book is an introduction to the mathematics used in the design of computer and network hardware and software. We will survey topics in computer arithmetic and data representation, logic and set theory, graph theory and computer measurement. 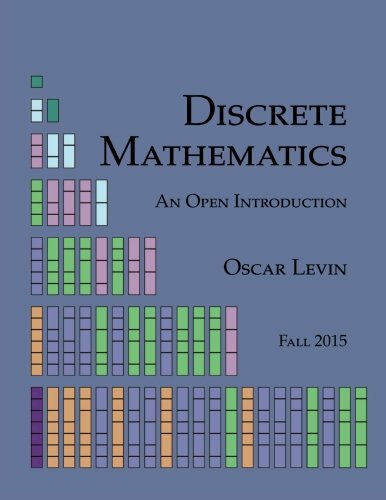 In this book, four basic areas of discrete mathematics are presented: Counting and Listing, Functions, Decision Trees and Recursion, and Basic Concepts in Graph Theory. At the end of each unit is a list of Multiple Choice Questions for Review.